That night we play cards in the ranger’s hut: a game of “Up and Down the River”. Despite my ignorance of the rules, I finish equal second, almost clinching a card-shark reputation. On the walk back to my Nissen Hut a full moon sails clear of cloud. I take my camera down to Moth Creek to try and photograph her reflections. I always seem to think of the moon as feminine. The creek is wide and still, and the moon reflects perfectly from its molten, dark surface. But my photographs fail to capture her wonderful light and alluring face. Some faces just resist being well photographed. I suppose that’s what memory is for. Though I’m standing on a modern jetty, the moon reminds me that this area holds far older stories. It's highly plausible to view this whole south-west landscape as an artefact of Aboriginal burning over 30-40 000 years. Looking at the broad expanses of buttongrass, and the relatively small patches of forest, it makes sense. Buttongrass thrives under a regime of regular, if small scale, firing. If its left unburned, scrub and then forest start to assert themselves over moorland. With rainfall as high as what is received here, you would, under other circumstances, expect to find much more rainforest. Indeed you do find it along rivers and in sheltered patches, but it’s not as expansive as it might be. Why did Aboriginal Tasmanians burn this country? Two reasons stand out. Firstly fire in buttongrass moorland is followed by strong regrowth, and this “green-pick” attracts grazing animals. They are more easily seen, and more easily hunted, when concentrated in a small recently-burned patch. Secondly a burned landscape is easier to move through than a scrub-covered one. That’s good for a nomadic people, as any bushwalker could confirm! The so-called “conciliator of Aborigines”, G.A. Robinson, walked through this area with his party in 1830. Whatever harm his attempts to round-up and resettle the original Tasmanians might have done, he seems to have been motivated by a genuine concern for them as human beings. This, remember, occurred during a time of martial law in an often lawless colony. Life was cheap, and the lives of natives, for some, ranked below that of livestock. The impact and worth of Robinson's missions may be vigorously debated, for sure. But on a purely physical level, his journeys through this country were extraordinary. For over four months, Robinson and a party of up to 20, journeyed from Recherche Bay in the south-east to the far south-west and west coasts. They walked first along what are now the South Coast and Port Davey Tracks, at the time either untracked or Aboriginal routes. 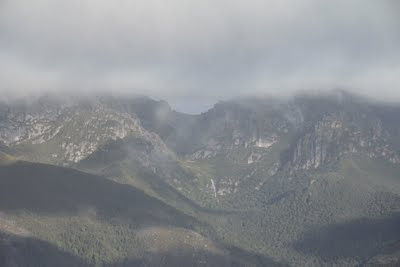 They then travelled to places as fearful - and exciting - to bushwalkers as the Western Arthur Range and the west coast between Window Pane Bay and Macquarie Harbour. 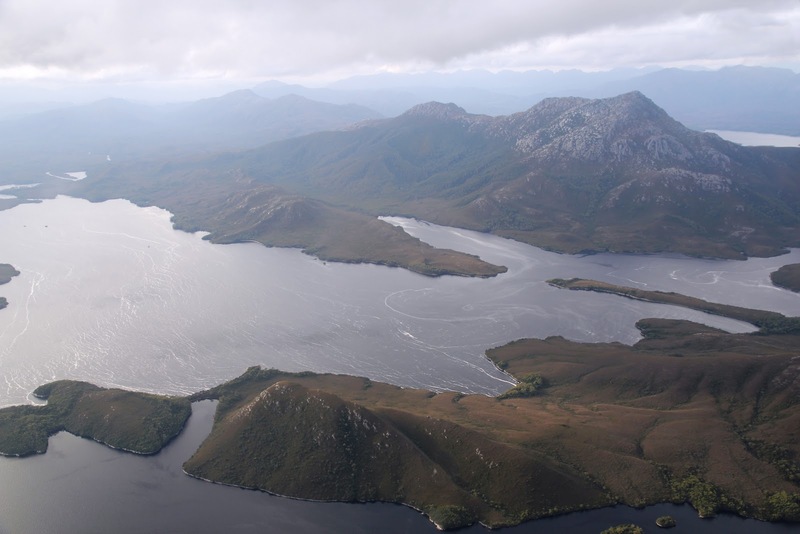 An aerial view of the rugged Western Arthur Range in fine weather! Robinson kept a detailed journal, at times accutely describing the ruggedness and beauty of the landscape; at others bemoaning the numerous illnesses, personnel difficulties and weather set-backs of the summer/autumn trip. An excerpt from 10 March 1830, gives a flavour. Here nature appeared in all her pristine forms; perpendicular cliffs, immense chasms through which the water was heard to gush with frightful roar, mountain tops hid in the clouds, and anon the piercing wind gushing up the ravines rendered our situation truly uncomfortable. I continued still very unwell. Yet there was no alternative; to decline was useless. No medical assistant, no friend near to soothe or to offer consolation. The night excessive cold. While the party was occasionally re-supplied by boat, it was otherwise self-sufficient. I marvel at this mixed group of British and Aboriginal men making such a journey without all the 'survival' gear modern walkers count essential. But then Robinson and co. had both the assistance of the 'natives' (as they called them) and the psychological goad of not wanting to concede to 'weakness' in front of the same. The dubious reputation of Robinson within the contemporary Tasmanian Aboriginal community is tempered for some by the detailed observations he made of Aboriginal life, beliefs and customs in the 1830s. While he may not always be trusted as accurate, there are precious few other contemporary accounts. 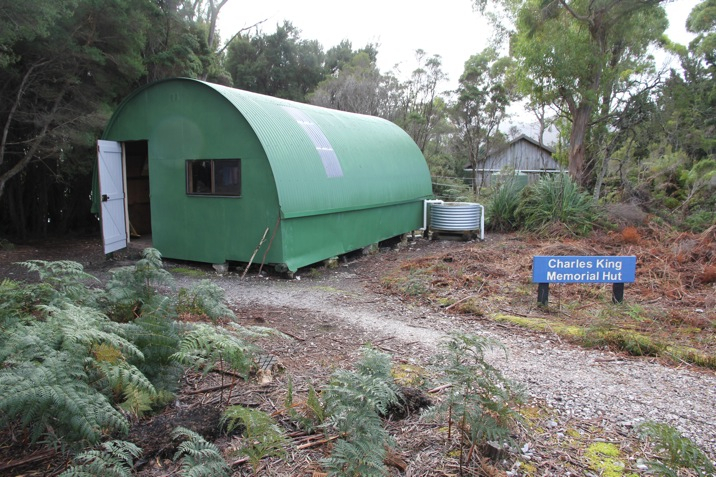 We've noted already that Robinson saw many Aboriginal huts around Melaleuca, and that the area appeared to be a “resort” for the Needwonee people. 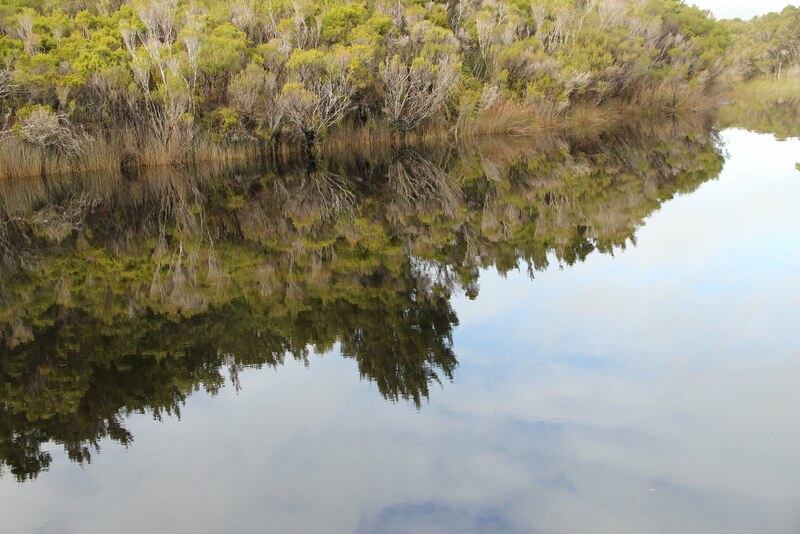 Apart from having a good supply of water, game and especially swan's eggs, the area between Melaleuca and Cox Bight also appears to have had a strong spiritual significance. Through conversation with his Aboriginal companions, Robinson learned that one of their central creation stories took place here. In that tale one of the ancestor spirits, Moinee, “was hurled from heaven and dwelt on the earth, and died and was turned into a stone and is at Coxes Bight.” This is probably at Point Eric, in the middle of the bight. Visiting this broad, bleak and beautiful landscape, it is not difficult to see its special significance. The river of time has touched this place over a very long period, with little else to obliterate its work. Before the Moinee story, before Cox Bight even existed, sea levels were much lower than they are today. The Needwonee’s ancestors would have walked over land to what are now the De Witt and Maatsuyker Islands, but what would then have been hills. The river flows back further still. Before humans, there were other animals. During our visit we see many birds, including wonderfully cryptic ground parrots, and some mammals, especially pademelons. We find evidence of many more: a ringtail possum dray in a tree; wombat droppings; echidna scratchings. All of these have lived here, and in landscapes that have now worn away, for millions rather than thousands of years. Where's Wallicus? 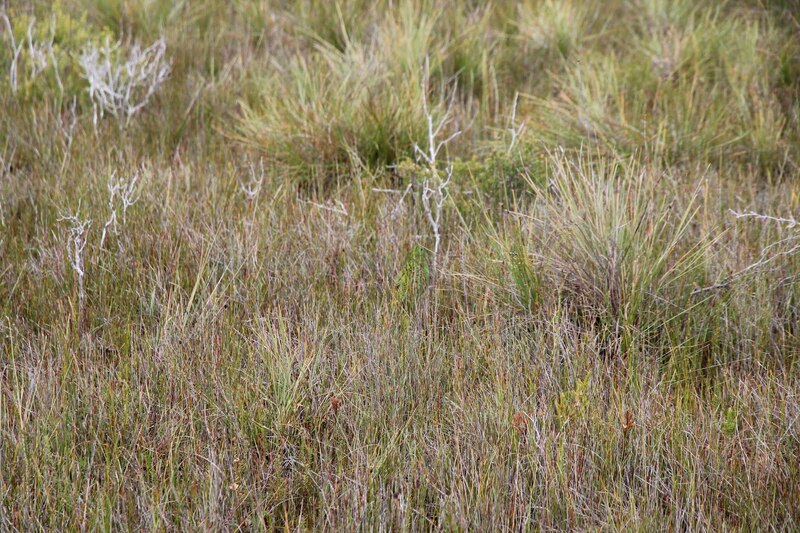 Can you find the ground parrot (Pezoporus wallicus) in this picture? But that too is an eye-blink in geological time. The quartzite that is the foundation of much of the south-west is Precambrian rock perhaps one billion years old. The moon is around four billion years old, the earth itself older still, and the river of time flows back beyond that. That night, as I stare at the moon reflecting from the surface of Moth Creek, I ponder the whole nature of time and space, and what is behind it all. Some, like me, sense a mind … even a heart. Some sense nothing at all. But both are ready to be awed and humbled by that experience. Better that than never stopping to reflect at all. Resort (noun): a place to which people go for recreation, rest, etc. Melaleuca is not the place to live if you’re used to popping in on the neighbours for a cup of sugar. To call it isolated is an understatement. Surrounded by half a million hectares of Tasmania’s south-west wilderness, it’s either an hour long flight, or a multi-day foot or boat trip, from any population centre. It’s also Tasmania’s weather frontier. The day we flew in was the first flight to reach the rough gravel airstrip in six days. Torrential rain, low cloud and high winds had kept planes from getting here. As we unloaded, a desperately relieved German bushwalker almost hugged the pilot. He’d been waiting five days for a flight out of the wilderness after a wet and wild walk along the South Coast Track. But isolation and wildness notwithstanding, wilderness is a moot word in these parts. Even flying in over the tweeded hills, with water reflecting back at us from almost every surface, we make out the clear signs of the small-scale mining that has been carried out here. A series of unnaturally straight channels in the flattish landscape show where strips of over-burden had been removed in the search for tin. Mining has finished now, and the excavated strips that are visible from the air are disguised and overgrown at ground level. But the buildings and some of the machinery used by the miners: first Charles King, then his son Deny King, and also the Willson family, can still be seen. Charles Denison (Deny) King, the second generation of Kings to live and work here, is the best-known of the people who called Melaleuca home. Not only did he mine the area for decades, he was also a naturalist, artist, and advocate for Tasmania’s wildlife and wild places. He became host and friend to many bushwalkers, artists and others who visited the remote “kingdom”. A century before the coming of the Kings, the so-called “conciliator of Aborigines”, G.A. Robinson, walked through this area with his party in 1830. He noted many Aboriginal huts, and thought it “a resort for the natives”. Deny King must have had a similar feeling for the country. He moved here as a young man in 1936, and stayed until his death in 1991. Although twenty years have passed since then, his legacy at Melaleuca continues to be cared for by family and friends. Part of that endowment is the buildings that are still in use today. They include the distinctive Nissen huts that became home not only for the King family, but also for visitors to the area. 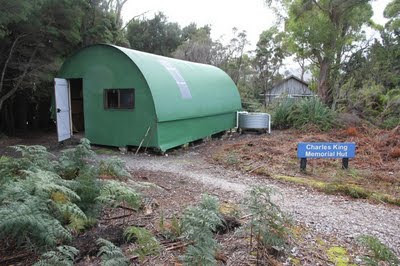 Today two are open for public use, including the Charles King Memorial Hut, while the original is still occasional home for Deny’s descendants. To visit his garden, and peer into the many outbuildings that are still cared for, is to feel still the presence of this extraordinary individual. Typical of the man, the private garden remains open to the public. His family simply asks that their privacy be respected, and for a donation to help with the upkeep. Especially evocative is the boatshed on Moth Creek. Inside we find “blue boat”, freshly painted and ready for use. A smaller cream-coloured dinghy floats free on the bank. The creek is still and calm, as dark as stout from the tannin-rich waters that wash from the surrounding hills. Deny’s semi-outdoor art “studio”, complete with a palette, benches and a contemplation chair, is perched on the bank above the creek. His blue chair, upholstered in hessian, is even monogrammed with his initials. There is a hush about the place that seeps into you. Everywhere there are birds. 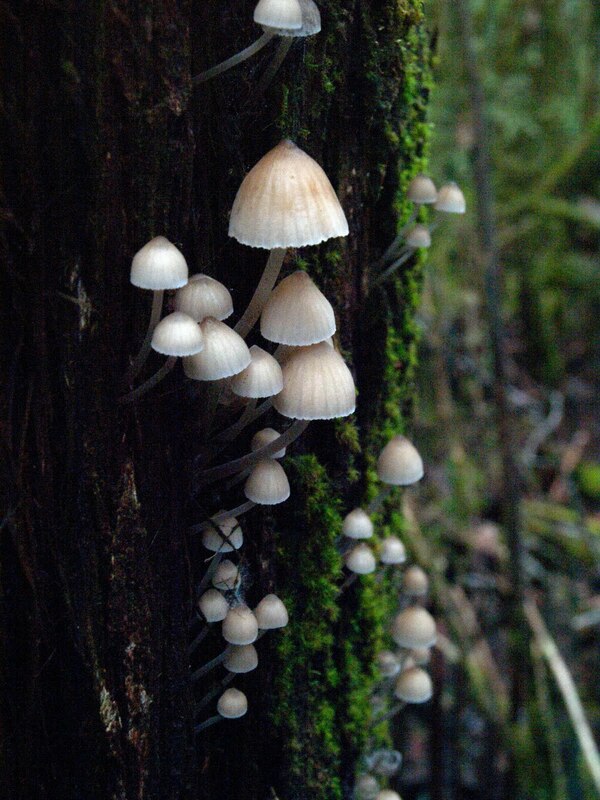 They chat and flit between native trees and the exotics that Deny mixed together. Here and there pademelons hop about, probing for fresh fodder. Our visit has come on the tail end of a strong south-westerly weather pattern. In a place that is otherwise almost silent, we are surprised to hear a distant roar, like that of waves on the shore. But with Cox Bight nearly 10km south-east of us, we think that unlikely. It turns out to be precisely the correct explanation. Swells between 7 and 10 metres are pounding the distant coast. With no wind or ambient sound to interfere, the muted crashing of waves is our background noise, a literal white noise. One of our party, a first-time visitor to Melaleuca, is finding it hard to sum up the difference between her expectations and the reality of Melaleuca. It seems it is both more and less than what she expected. Its physical presence is less commanding: with no wildly high mountains; no cascades tumbling into deep ravines. And yet there is a wildness about the place, a blend of isolation, open skies, bleak weather and a brooding sense of the past. Together they seem to produce a profound calm that might help you understand why generations kept returning to this "resort". The day started well. If it's going to be cold and wet, you may as well have something to show for it. And we did. 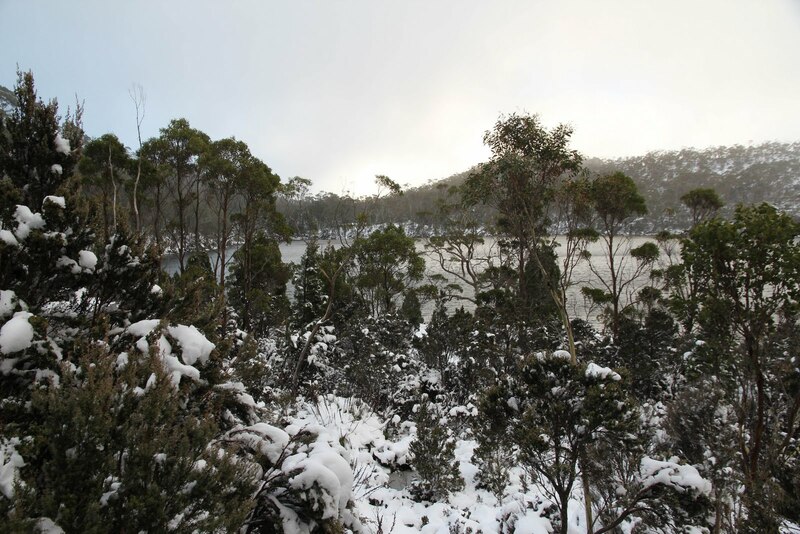 Kunanyi/Mt Wellington was coated with snow to low levels. As we drove towards Mt Field National Park for the weekend, more mountains, from Domedary to Collins Cap, and Trestle to Field East, were looking at their best, a fine mantle of snow over the shoulders of each, and down to the surrounding hilltops. We'd forgotten, however, that the same beautiful snow might make it a little difficult driving our two-wheel drive vehicle all the way to the ski hut at Lake Dobson. An ignominious retreat, a delay, and a lift up the mountain in our friend's 4WD eventually got us up to the snow-bound hut. While the temperature hovered around zero, and snow flurries added to the already good ground cover, we revived ourselves with hot drinks by a warm fire. My thoughts turned to those caught out in this weather with no such luxuries, in particular the native animals which call the mountains home. How did they cope in weather like this so early in the season? Then Phil walked in carrying a bucket of wood shavings. These are kept in the hut toilets and are used to help aerate the composting toilet waste. Three furry grey blobs, each about the size of a hacky sack (or for the Potter-philes, a small snitch) huddled in the bottom of the bucket. Pygmy possums! To be precise eastern pygmy possums, Cercartetus nanus. These featherweight marsupials weigh between 15 and 40 grams, and stretch to maybe 90 mm in length, excluding the tail. They had apparently climbed into the buckets for warmth, and to shelter from the early and heavy snow, and had become trapped. We pick the little creatures up to check for signs of life. Disproportionately large dark eyes blink at me, whiskers slowly twitch, and a rapid heart beat flutters faint against my hand. Finally its long, bare and exquisitely curled tail unwinds. 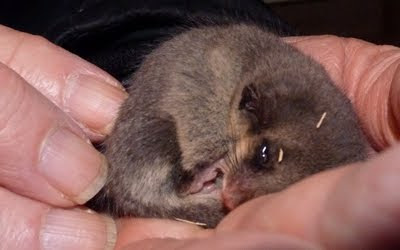 Pygmy possums use their tails to help them climb around the forest canopy, where they feed, mainly on nectar. However they are also known to take invertebrates, including moths, which they can spot at night using their large and sensitive eyes. Another member of the Burramyidae (pygmy possum) family is the mountain pygmy possum, which famously feasts on bogong moths in the Australian Alps every summer. That mountain variety hibernates for much of winter. With weather as fickle and occasionally freezing as that in the Tasmanian highlands, eastern pygmy possums have opted for mini hibernation, or torpor, during cold spells rather than full hibernation. Their body temperature lowers close to the ambient temperature, and their metabolism drops correspondingly, decreasing their need for energy inputs. Torpor lasts from a few days to a few weeks, perfect for the “here today, gone tomorrow” nature of snow in Tasmania. The eastern pygmy possum was first described by French naturalist Francois Peron in 1802. Peron collected a live pygmy possum from an Aboriginal man on Maria Island, in exchange for some trinkets. The Frenchman was of the opinion that the Aboriginal man was going to cook and eat the tiny mammal – hardly a square meal! Our hut-visiting pygmy possums don’t seem unduly concerned at our handling of them, and when we reposition them in a shallower container, they simply shuffle close together and continue their slumber. We check the “fur kids” several times in the early evening, as much smitten by their furry charms as for any real help we might have offered them. When it’s bed time for us, we put their open container out in the vestibule, and leave them to it. We figure, correctly, that they will move on during the night. As I settle into my sleeping bag in the near-to-freezing bunkroom, I shiver for the first minute or two, waiting for the down bag to have its effect. 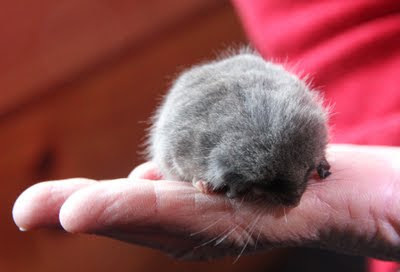 In that moment I envy the pygmy possum its ability to curl into a ball. And as the wind thumps into the side of the hut, and whistles through the door and window cracks, I start to see why the occasional period of torpor might have a lot going for it. The 2011 Prize attracted entries from writers all over Australia, and as far afield as Newfoundland, Canada. The Prize winners were announced in April during “10 Days on the Island ”. The free event was held at the Upstairs Function Room, Republic Bar (cnr Elizabeth and Burnett Sts, Hobart), and hosted by the Tasmanian Writers Centre. 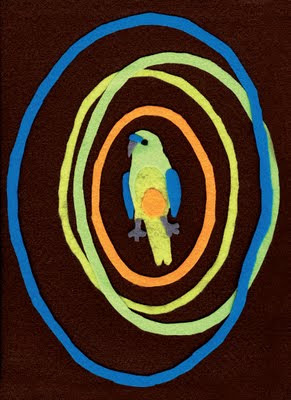 Peter Shepherd (Upper Brogo, NSW) for his essay “In the Land of Nod”. Peter receives $5 000 plus return airfares to Hobart and a two week residency in a Tasmanian national park. Elizabeth Bryer (Yarravile, Vic) for “Of Stars and a Lake”. They each receive $250. Congratulations to all of the winners, and thanks to all authors who submitted works. The Wildcare Nature Writing Prize has been, for some years, both my inspiration and my big stick. It has led me, each time I have entered (third time lucky, hey? ), to a new level in my writing. What drives me is respect: for the existence of the prize, for the standard, and for its aim of drawing attention to what nature writing can offer. I believe it can offer a lot. No, actually, I believe it can offer the world. Through the practice and teaching of nature writing I've discovered the importance of intimacy in this way of communicating with the world; of grace and courage and all those things that make good writing a yearning toward something fundamental and large; a search that drives every human heart. Nature writing, I believe, is our best hope for a language of connection. And that is because the connections it offers are those beyond the fences of industrial culture. Nature writing opens a space to listen to the larger spaces in which we are woven: skies, mountains, oceans, history and future, and the land itself. It suggests the possibility of listening in ways not just brain-based, but to the spiritual poetry of wonder. Without losing the critical importance of the everyday poetry - children, laughter, this single rock, the colour and miracle of this particular fungus. The human commons. The earthly commons. Seeing neighbours despite how many legs they have or which end of their body they breathe out of. And sharing the story of it. Whatever you want to call it - nature writing, earthspeaking, or just plain writing or sharing - here is a call, as I see it, to reclaim our wild human heritage, to fling heartfelt poetic truths into the world around us in shapes and connections that the shallow plastic of industry-speak simply can't stand against. Without root and blood how could it? Without breath and a proffered paw, wing, hand and chirruping, sky-scaling song, what chance does it stand? None, despite the sheer volume and effort of it. None, because it cannot stand eye to eye and heart to heart with one other and say, "I see you. I hear you. And I care." Nature writing can. And, through rebellious spirits everywhere, will continue to deepen and expand, and reconnect with a song and language that has never been lost, but has merely been waiting for us to come home again. I want to thank fellow conspirators: Island Magazine, Wildcare and Tasmanian Parks and Wildlife, the Tasmanian Writers Centre, all the poets and writers and dreamers and hopers and passion painters who have entered, and continue to enter, this award. And Peter Grant, whose persistence, work and vision makes it possible, beard and all. And my partner, now my fiancé, Jurnee, who holds a deep standard or writing and being that, it seems, the earth itself holds in respect. And our kids - Darcy, Teia and Niamh - who, by their simple existence, remind us of what is ultimately important. "Where I live it gets dark at night. The kind of dark eats up the light." Alexi Murdoch from the song "Someday Soon". This afternoon the bush track is different. I know it well, I walk here two or three times a week, and yet I am suddenly uncertain which turn leads where. My steps have become tentative, feet threatening to roll on the uneven ground; eyes darting left and right; hands out ready for a fall; breath coming a little heavier; ears half-listening for threat. It is the light dying. Our days are shortening, our nights attenuating. The chill air is asserting itself. Even the garden is telling me that we have gone beyond Keats’ season of mists and mellow fruitfulness. Today, having deliberately caught the wrong bus so I could walk down through the bush to my home, I find it almost too dark to negotiate my familiar but steep bush. It is an unwelcome reminder: for the next few months I will be arriving home in the dark. Thoughts of migration begin whispering in the heart. This morning a mass of short-tailed shearwaters, over a hundred strong, was visible from our deck. They are the last of their kind to leave, fledglings grown fat on a fish diet provided by devoted parents. They are sometimes too heavy to fly, and must exercise off some podge by flying around the coastal hills. Within days they will begin their phenomenal 15 000 kilometre migration to north Asia and Alaska. Their wonky, whirling flight briefly awakes something in me too. I think of fellow Hobartians who head north every winter, keen to follow the sun. Most of us make do with the promise of some surrogate sun in the hearth, by ensuring that our wood supply is ready. If it is only a consolation, it is a delicious one. Despite fleeting thoughts of winged escape, I love autumn. Its crisp nights and clear days, its galleon clouds and galloping winds all portend the longed-for possibility of snow. Yet I find a subtle down-cast in my mood. An inexplicable sense of loss and melancholy grows with the dying of the light. Thirty years of experience in the south of this island tells me that winters here are seldom hard; that active outdoor life will continue despite the cold; that wild weather is beautiful; that the garden can still be worked, and will still bring forth produce. 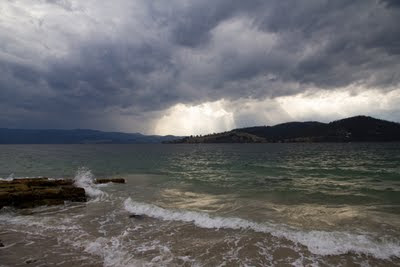 Regardless of what the rest of Australia imagines, Tasmania has a mild maritime climate. Certainly our latitude south is similar to that of northern places like Toronto and Vladivostok. But in terms of weather, there’s no comparison. Our temperatures stay regulated by the (milder) oceans. So I know there will be no Siberian – or Ontarion – winter extremes to deal with in the coming months. And yet I still find it hard to shake the melancholic edge that hovers around my thoughts as May days descend towards night. Rather than “snap out of it”, I decide to sit with the feeling, allowing it to play with me for a while. A shower of bullet-like rain spatters on the roof. Squalls rush in from the south. Although the light is fading fast, I can make out that snow is engulfing the highest parts of Kunanyi /Mt Wellington. Tonight will be a cruel one for some of the mountain’s creatures. I begin to see that for me dark and cold and winter are signs of loss, decline and even death. These are not topics most of us enjoy facing, but they are realities. And they are undeniably sad. But I also begin to see that within the same there are possibilities of renewal. I think of Albert Camus’ meditation on winter: "In the depth of winter I finally learned that there was in me an invincible summer." It may take the heat of an artificial sun and the support of family and friends, but I – like most of us – will get through this winter. And in recognising my own decline and death in its gentle jaws, I also somehow recognise the power and wonder of being alive: perhaps a personal migration.